Deputy Sheriff Claims Joe and Orin Simpson Attacked Him and He Shot in Defense. Duluth, Ga, February 20 -- (Special) Joe Simpson and Orin Simpson, brothers, prominent farmers of this county, were shot and killed this afternoon by Deputy Sheriff Victor Dowis, when they refused to allow the officer to search their automobile for whisky. Dowis surrendered to the sheriff in Lawrenceville tonight. After the shooting, the automobile was searched and no liquor was found. Orin Simpson was killed instantly, while his brother died two hours later. Just before he died, he is said to have made a statement denying that any whisky was in the car and accusing Dowis of murder. Dowis received information this afternoon, it was stated, that someone was loading whisky into a automobile just outside the corporate limits of Duluth, and was requested to make a search. Proceeding to the place, he found the automobile of the Simpson brothers and attempted to search it. The two brothers are said to have refused permission to make the search unless a proper warrant was produced, witnesses stated, and Dowis sent to Duluth for a warrant. When he presented his warrant, the Simpson brothers asserted that it was not the proper paper authorizing a search of the automobile. Dowis then attempted to proceed with his search, eye-witnesses stated, and the two farmers objected, forcing the officer from the automobile. Dowis drew his pistol and started shooting, it was asserted, killing Orin Simpson instantly and fatally wounding Joe Simpson. There was no one in Duluth to arrest the deputy sheriff and the sheriff was summoned from Lawrenceville. In the meanwhile, Dowis left Duluth and met the sheriff en route to the town, and surrendered. Relatives of the men tonight declared that they would charge Dowis with murder and prosecute the case to the finish. DOWIS SAYS HE SHOT IN SELF-DEFENSE. Lawrenceville, GA, February 20 -- (Special) -- After a conference with Deputy Sheriff Victor Dowis, who is held in jail here following the killing of Joe Simpson and Orin Simpson near Duluth yesterday, Senator O. A. Nix, attorney for the officer, issued a statement tonight to the effect that Dowis had shot in self defense, and that both of his alleged assailants were partially intoxicated at the time of shooting. "Mr. Dowis, who is marshal at Duluth, as well as deputy sheriff, was requested to search the Simpson automobile by a citizen of the county," said Senator Nix. "When he approached the car, he was denied permission. He then sent back to town for a warrant, and when it arrived started to make the search for the liquor. The deputy sheriff is a brother of Rev. Solomon Dowis, pastor of the Baptist church at Duluth; F. F. Dowis, cashier of the Bank of Suwanee; and W. H. Dowis, a member of the G. M. C. faculty. He is married and has three children. 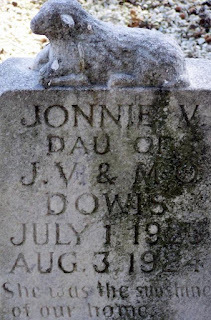 Later that year, on 11 September 1922, Deputy Sheriff Victor Dowis went on trial for murder "in connection with the shooting by him of Joseph and Orin Simpson, brothers." Victor Dowis was acquitted of the charge. Family lore states Dr. O. O. Simpson stood on the courthouse steps after the disappointing verdict and offered $10,000 to anyone who would kill Vic Dowis. Duluth, Ga, January 27 -- (Special) -- Victor Dowis, former deputy sheriff of this county, narrowly escaped death before daylight this morning when he was fired on as he was driving to Atlanta in his automobile. He is employed in Atlanta, but his family still reside near here. He was returning to Atlanta from an overnight visit home when the attack took place. About a mile from here at Carolina crossing two shots shattered the windshield, the flying glass inflicting slight scratches. No clue as to the identity of the ambushers has been found. Apparently, someone made good on another attempt when Victor was shot and killed less than six months later. 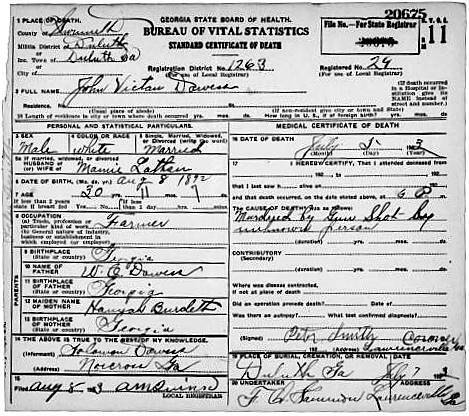 His death certificate states the cause of death as "Murdered by gun shot by unknown person." 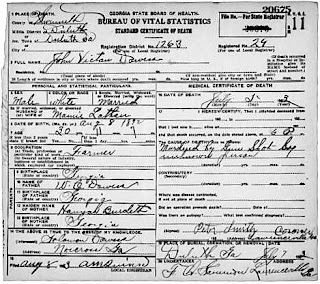 Simpson family history suggests Joseph and Orin's older brother Alexander Hamilton Simpson committed the act of murderous revenge on Victor Dowis. And it is asserted that yes, he collected the $10,000. 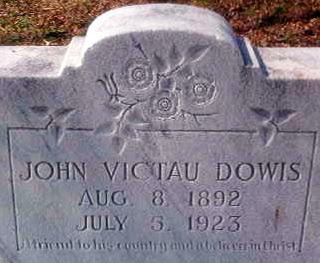 Mamie Lantham Dowis, Victor's wife, gave birth to a daughter just four days before Victor was killed. Little Jonnie V. died a year later. She, too, is buried in the Dowis family plot at Duluth Church Cemetery. Wow! Incredible story!! Amazing, the things you find from researching tombstones you find in a churchyard.